After the success of the concept-tour last year, it returns in 2018 again: MTV Headbanger’s Ball on tour! 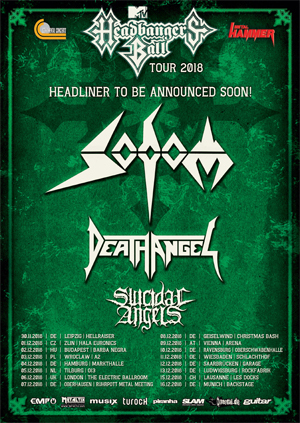 This year the concert-reincarnation of the 80s cult-TV-show managed to get SODOM, DEATH ANGEL and SUICIDAL ANGELS into the tour bus. The new structured Ruhr-Area-Thrash-Heroes among the Metal-Dinosaur Tom Angelripper, shortly named SODOM, recently achieved to set the Rock-Hard-Festival on fire! The first time with two guitarists on stage, you can expect a highly entertaining show, with a special set-list. The American Thrash Metal act DEATH ANGEL will come along, to present their tight Thrash Metal, which they are playing since the 80s and will – as always – take no prisoners. The youngest band in the line-up will be the Greece underground-champions of SUICIDAL ANGELS, which lately were celebrated as the opening act for the mighty SATYRICON! The next headliner will be announced soon! Stay tuned! !